On September 25 of this year I took on my biggest cooking challenge ever, so big that I lay awake for three nights wondering if I could pull it off as well as I thought I could or if I would sink like the Titanic. 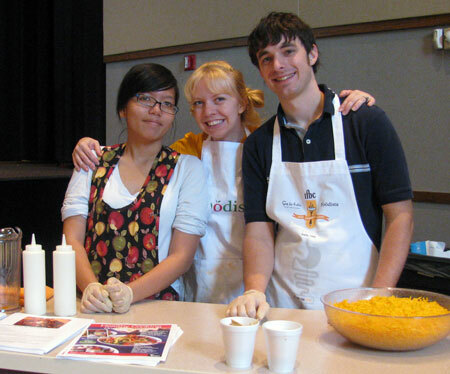 The good news is, it was a huge success and cooking for 1500 was not as daunting as it sounds. The South King County Latino Health and Safety Fair is an annual event held in Auburn to provide resources, health screenings, and connections to the Latino Community. 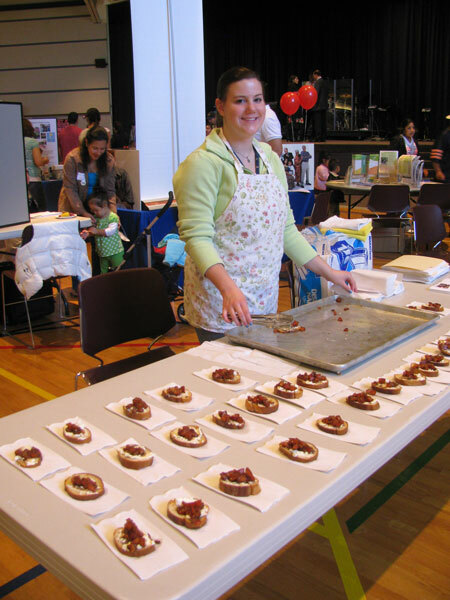 Last year they had around 1250 people attend and the food was a plated lunch. The line for food was a writhing serpent that wrapped around the gym (at Grace Community Church) and interfered with the flow of everything else. This year, my friend who was on the planning committee suggested that I write up a proposal for doing the food, and I thought it was a great way to get even more involved in my community. 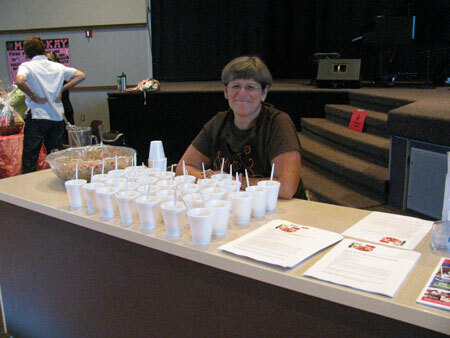 I proposed doing multiple healthy food samples spaced throughout the room, along with copies of the recipe and tips on making it more affordable. The committee loved it and so preparation began. We weren’t sure how many people would be there, it could be more or less than the previous year, so the number 1500 was thrown out there and that’s what I planned for. Now, I’ve helped cook for large numbers before, but NEVER 1500. I put the word out on Facebook that I was looking for volunteers, as well as asking some students we work with. Counting Eric and I, our team was 8 strong. That Thursday I spent 9 hours shopping for food! I cleaned out several of Sam’s Clubs shelves and also went to Cash and Carry and Safeway. Did you know Cash and Carry has a gallon of balsamic vinegar for only $14? I did a happy dance for the money saving on that item! Friday was prep and three of us worked 12 hours that day. A couple other volunteers showed up when they could get away from work or school. 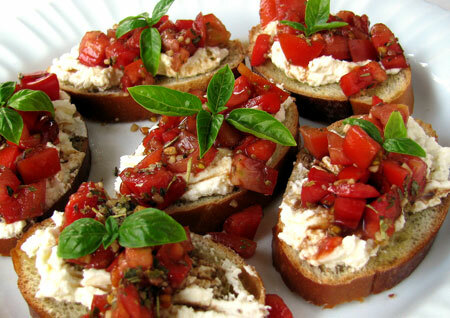 We used fresh tomatoes for both the bruschetta and the white bean and tomato salad. 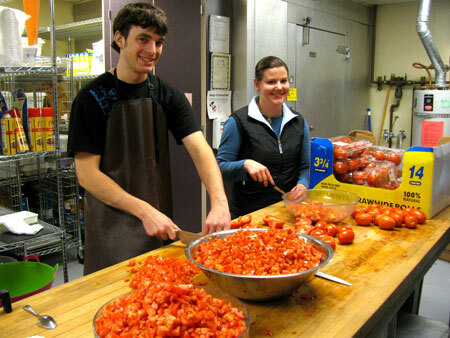 By the end of the day Kailee and Eric were seriously pros at tomato cutting! Cynthia went to town on the onion chopping for taco soup, and somehow never started crying from them like the rest of us. 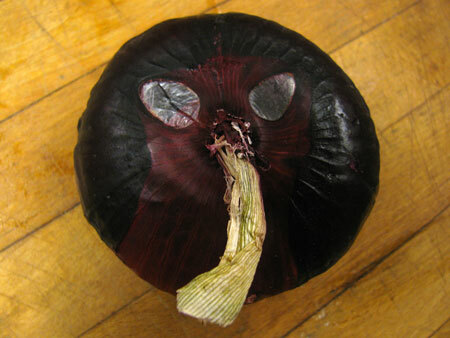 Oh, and Eric discovered that cute little onion which I dubbed “the alien”. 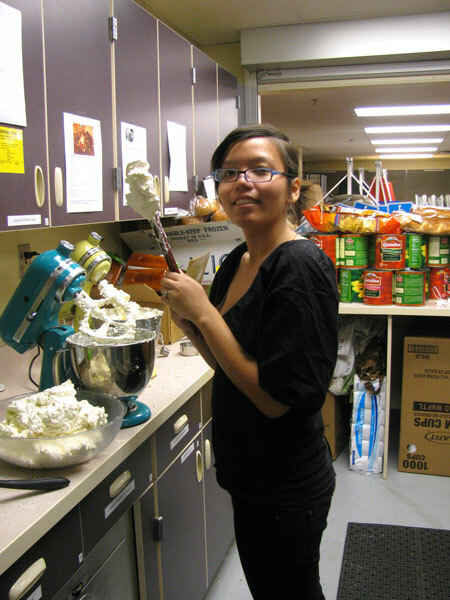 Tran did a great job mixing up the cheese spread for the bruschetta (recipe is below!) 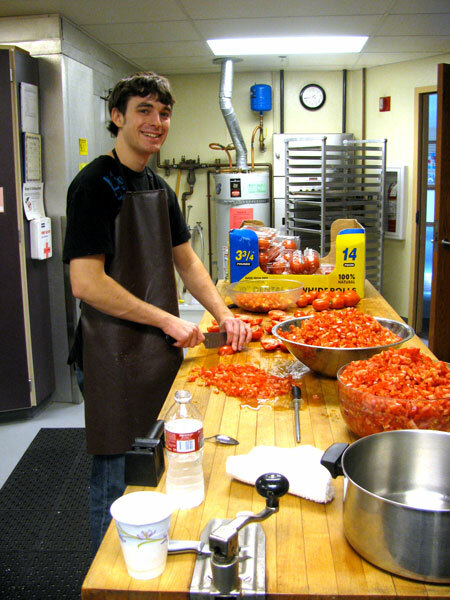 and I got started on slicing bread and making 50 gallons of taco soup. 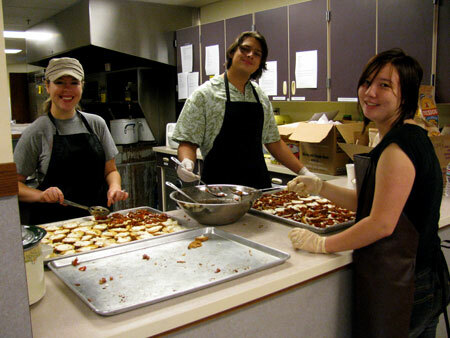 On Saturday morning we showed up bright and early to start heating the soup and assemble the bruschetta. I must admit that all the planning put quite a stretch on my math skills, but we ended up with plenty of food and, because there weren’t actually 1500 people that day, had enough to share with other ministries and groups who needed a meal to serve. There were a lot of great stories from the fair. One woman was so excited about the idea of free cooking classes (I had fliers at each booth) that she ran all over the fair exhibits, like mouse running frantically through a maze, to find me and ask for more details. 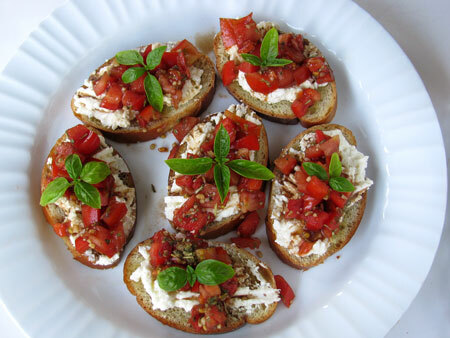 Another woman had never heard of bruschetta before; she loved it so much that by her 8th piece she made me sit down and walk her through the recipe step by step to make sure she could make it at home. 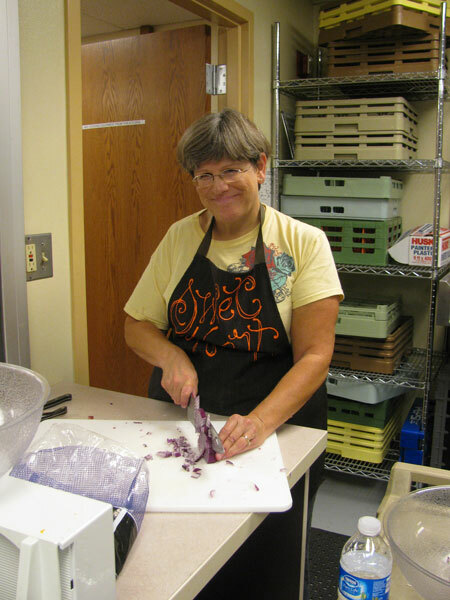 I had several non-profit organizations connect with me about offering cooking classes to the populations they serve as well. I’m always looking for new opportunities to help out, so that is pretty exciting! I would have to say that the bruschetta booth was probably the most popular. 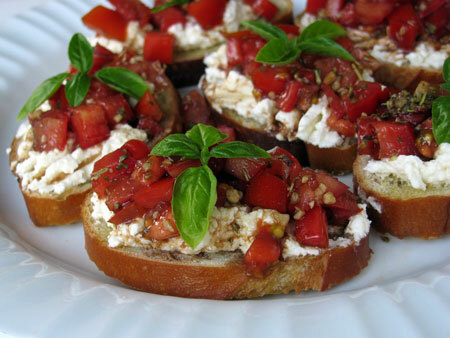 It’s hard to go wrong with toasted bread, creamy tangy cheese, and balsamic and garlic tomatoes in Italian seasoning! Even making 1500 of them was not as difficult as I anticipated. It’s a pretty simple recipe that’s great for a party appetizer or a light dinner. The recipe below is for serving at a party, it makes 40 pieces. You can DEFINITELY cut the recipe down. I make this all the time for Eric and I for a dinner appetizer. I plan on three pieces per person that way. I’d suggest just making the full amount of cheese spread though. Even if you end up with more than you need, put it in a baggie in the fridge. The next day you can melt it in a pot with some milk and it makes a great cheese sauce for pasta. Hooray for re-purposing leftovers!!! Preheat oven to 350 degrees. Brush the top of each slice of bread with a little olive oil. Spread slices onto one or two cookie sheets (in a single layer) and toast in the oven about 7-10 minutes, until just golden and crispy. While bread is toasting, mix cream cheese, feta, lemon juice and pepper until creamy. In another bowl mix tomatoes, balsamic vinegar, Italian seasoning, the 3 TBS olive oil and chopped garlic. When bread is ready spread each slice with a spoonful of the cheese spread and top with a spoonful of marinated tomatoes. Approximate cost/serving: This is such a cheap dish! I can get 2 baguettes for $2 at Sam’s Club (If the other one goes stale I use it for bread crumbs, bread salad, or bread pudding). I also get the cheeses in bulk there. Making the full batch only costs me $3.50. That means just 9-12 cents each. Even if people eat 2-3 it’s still incredibly affordable. Vegtarian/Gluten Free: Yes to vegetarian, and you could make this on gluten free bread or crackers. Ooh, great blog! I found you via the October: Unprocessed post. As I read about you, I thought “that’s my dream job!” While a lot of people blog in the hopes of having a career, I just want to inspire people and teach people how to eat well on just a little bit of money. I like to think that I’ve at least inspired some coworkers. At my last two jobs, life started with me as the *only* person brown-bagging it in the lunchroom. 6 months later, it’s standing room only some days. That is sooo cool to see the pics after hearing about the fair at the cabin. Diana I am so excited to see God bless you in what you love to do! ooooooooooh boy. this looks so good. much needed to try! !